Dr. Bektaş is an associate scientist at the Center for Transportation Research and Education. She serves InTrans as its resident statistical expert, applying statistical methods and data mining to a variety of transportation problems. 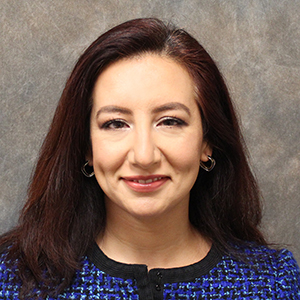 With an interdisciplinary background and master’s degree in industrial engineering with a focus on systems management, her research experience covers infrastructure asset management with a focus on bridges, pavement and pavement markings, performance measurement, risk and reliability analysis, engineering economic analysis, and transportation safety. Dr. Bektaş has served as the principal investigator on projects that address bridge management data and tools with the Federal Highway Administration, U.S. Department of Transportation, and Iowa and Minnesota DOTs. She chairs the Transportation Research Board’s AHD35 Bridge Management Committee and International Road Federation’s Asset Management Committee. She is a founding member of the AHD37 Bridge Preservation Committee and a member of the AASHTOWare Bridge Management Software Technical Review Team. Aldemir-Bektas, B. 2017. Predicting NBI Condition Ratings from NBE Condition Data by Recursive Partitioning. Transportation Research Record: Journal of the Transportation Research Board. No. 2612, pp. 29–38. Aldemir-Bektas, B., K. Gkritza, and O. Smadi. 2016. Pavement Marking Retroreflectivity and Crash Frequency: An Investigation of Segmentation, Data Imputation and Line Type Effects. ASCE Journal of Transportation Engineering. Vol. 142, No. 8. Aldemir-Bektas, B. 2016. Next Generation Bridge Management Tools and Inspection. Minnesota Department of Transportation, St. Paul, MN. Smadi O., N. Hawkins, B. Aldemir-Bektas, P. Carlson, A. Pike, and C. Davies. 2014. Recommended Laboratory Test for Predicting the Initial Retroreflectivity of Pavement Markings from Glass Bead Quality. Transportation Research Record: Journal of the Transportation Research Board. No. 2440, pp. 94-102. F. Bektas, B. Aldemir-Bektas. 2014. Analyzing Mix Parameters in ASR Concrete using Response Surface Methodology. Construction and Building Materials. Vol. 66, pp. 299–305. Johnson M., B. Aldemir-Bektas. 2013. Defining Bridge Preservation by Action Type. Transportation Research Record: Journal of the Transportation Research Board. Vol. 2361. Hawkins, N., O. Smadi, B. Aldemir-Bektas. 2013. Measuring Salt Retention, Center for Transportation Research and Education, Iowa Transportation Center, Iowa State University, Ames, IA. Hawkins, N. O. Smadi, B. Aldemir-Bektas. 2012. Evaluating the Effectiveness of Temporary Work-Zone Pavement Marking Products, Smart Work Zone Deployment Initiative, Iowa Transportation Center, Iowa State University, Ames, IA. Smadi, O., N. Hawkins, B. Aldemir-Bektas, P. Carlson, A. Pike, and C. Davies. 2012. NCHRP Project No. 04-38: Recommended Laboratory Test for Predicting the Initial Retroreflectivity of Pavement Markings from Glass Bead Quality, National Cooperative Highway Research Program, Washington, DC. Gao, J., B. Aldemir-Bektas, K. Gkritza, O. Smadi, N. Hawkins, and I. Nlenanya. 2012. Asset Management and Safety: A Performance Perspective, Midwest Transportation Center, Iowa Transportation Center, Iowa State University, Ames, IA. Aldemir-Bektas, B., A. Carriquiry, O. Smadi. 2012. Using Classification Trees for Predicting National Bridge Inventory Condition Ratings. Journal of Infrastructure Systems. Vol. 19, No. 4, pp. 425–433. Aldemir-Bektas, B. 2011. Bridge Management from Data to Policy. PhD dissertation. Iowa State University, Ames, IA. Smadi, O., N. R Hawkins, B. Aldemir-Bektas. 2011. Roadway Lighting and Safety: Monitoring Quality, Durability, and Efficiency. Center for Transportation Research and Education, Iowa Transportation Center, Iowa State University, Ames, IA. Hawkins, N., O. Smadi, B. Aldemir-Bektas. 2011. Wet-Reflective Pavement Marking Demonstration Project. Center for Transportation Research and Education, Iowa Transportation Center, Iowa State University, Ames, IA.